Secretary of the Air Force Heather Wilson and Air Force Chief of Staff Gen. David L. Goldfein shake hands and meet with members from the Light Attack Experiment at Holloman Air Force Base, N.M., Aug. 9, 2017. Wilson had an immersion tour of Holloman and is here for a live-fly experiment with off-the-shelf aircraft. The Air Force is pursuing a Light Attack Capabilities Experimentation Campaign, which has grown out of our Close Air Support Experimentation Campaign. The Campaign is being led by the Air Force Strategic Development Planning and Experimentation Office under Air Force Materiel Command. 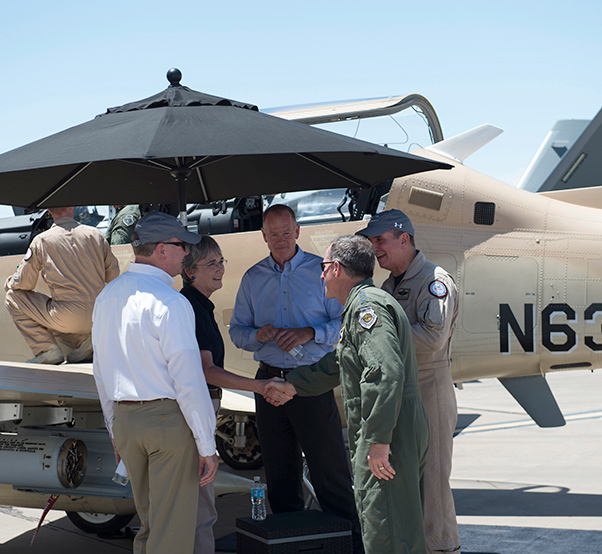 Secretary of the Air Force Heather Wilson and Air Force Chief of Staff Gen. David L. Goldfein, along with other distinguished visitors, observed a live-fly light attack aircraft experiment showcasing Air Force efforts for innovation Aug. 9, 2017, at Holloman AFB, N.M. 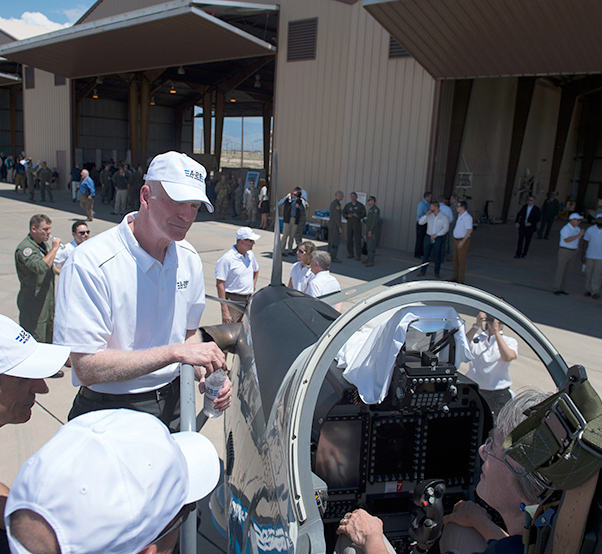 The intent of this experiment is to determine if such industry-provided aircraft can meet many of the sustained demands for combat airpower the Air Force has been experiencing for 25 years and to evaluate their utility in future force structure. “We want to meet the demands of more permissive environments at lower cost, we want to develop capabilities for contested environments, and use this experiment to evaluate the military utility of these kinds of aircraft and the manufacturing feasibility of these kinds of aircraft,” said Wilson. 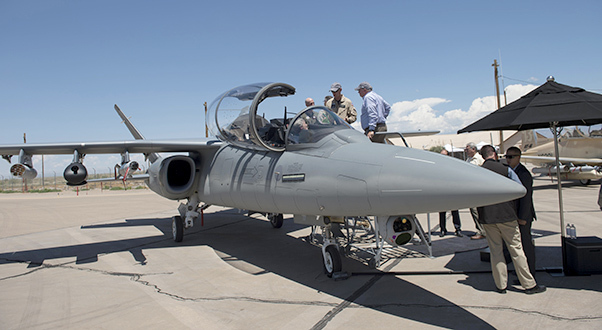 During the month long experiment, Air Force pilots are flying basic surface attack missions in Textron Aviation’s AT-6 Wolverine turboprop and Scorpion jet, Sierra Nevada Corp. and Embraer’s A-29 Super Tucano, along with the L3 Platform Integration Division’s AT-802L Longsword. Highlighted missions include close air support, air interdiction, combat search and rescue and strike coordination and reconnaissance. 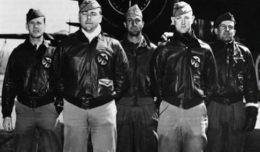 “It’s also about how we do things; we are looking for new ways to do business, new ways to get ideas from the lab bench to the flight line faster, new ways to get capabilities to Airmen who need them today and can’t wait two or three years for a normal acquisition process and the way they were forced to do things in the past,” Wilson said. Gen. Mike Holmes, commander, Air Combat Command, was also at the experiment and provided ACC’s perspective. Depending on the results of this assessment, a potential phase two could occur as early as 2018. Phase two is pre-decisional and might involve an Air Combat Command-led and U.S. Central Command-coordinated combat demonstration. The campaign is being led by the Air Force Strategic Development Planning and Experimentation Office under Air Force Materiel Command. 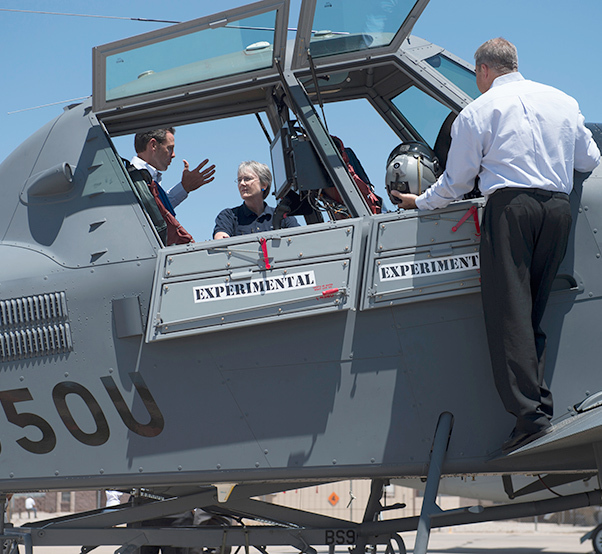 Secretary of the Air Force Heather Wilson meets with members from the Light Attack Experiment at Holloman Air Force Base, N.M., Aug. 9, 2017. Wilson had an immersion tour of Holloman and is here for a live-fly experiment with off-the-shelf aircraft. The Air Force is pursuing a Light Attack Capabilities Experimentation Campaign, which has grown out of our Close Air Support Experimentation Campaign. The Campaign is being led by the Air Force Strategic Development Planning and Experimentation Office under Air Force Materiel Command.